Bronchiolitis. EBSCO DynaMed Plus website. Available at: http://www.dynamed.com/topics/dmp~AN~T115760/Bronchiolitis. Updated October 26, 2018. Accessed December 12, 2018. Respiratory syncytial virus. American Lung Association website. Available at: http://www.lung.org/lung-disease/respiratory-syncytial-virus. Accessed December 12, 2018. Respiratory syncytial virus. Kids Health—Nemours Foundation website. Available at: http://kidshealth.org/parent/infections/lung/rsv.html. Updated September 2015. Accessed December 12, 2018. 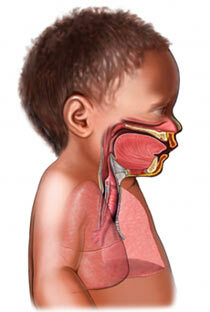 Respiratory syncytial virus (RSV). Centers for Disease Control and Prevention website. Available at: http://www.cdc.gov/rsv. Updated June 26, 2018. Accessed December 12, 2018. Respiratory syncytial virus (RSV) infection in adults. EBSCO DynaMed Plus website. Available at: http://www.dynamed.com/topics/dmp~AN~T116604/Respiratory-syncytial-virus-RSV-infection-in-adults. Updated September 22, 2018. Accessed December 12, 2018. 1/15/2010 DynaMed Plus Systematic Literature Surveillance http://www.dynamed.com/topics/dmp~AN~T116604/Respiratory-syncytial-virus-RSV-infection-in-adults: Kabir AR, Mollah AH, Anwar KS, Rahman AK, Amin R, Rahman ME. Management of bronchiolitis without antibiotics: a multicentre randomized control trial in Bangladesh. Acta Paediatr. 2009;98:1593-1599.